Is your garden shed bursting at the seams? Are you sick of tripping over garden tools and DIY equipment that just seems to be moved from one spot to the other without ever finding a permanent home? Then take a look at these inventive DIY storage ideas that will transform your outdoor space from messy to methodical in no time! 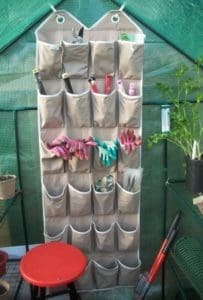 Pallets are a great storage solution for your long-handled garden equipment, and you won’t even need to get your toolbox out. 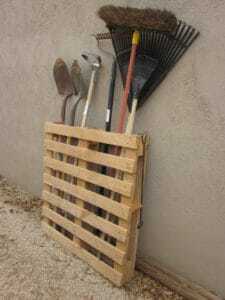 Simply stand the pallet upright against a wall or fence and slot the utensils into the middle of it. For easy access to smaller hand tools and paraphernalia, hang a few nails and hooks on the front of the pallet. It’s a quick and easy option, although if you’re in a crafty mood you could dress your pallet up with a coat of paint to match whatever’s growing in your planters. 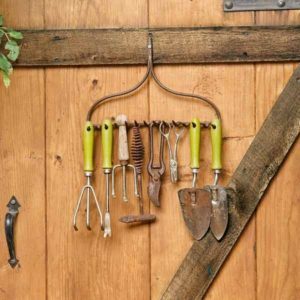 A disused rake head is perfect for hanging your trowels and forks on. Mount it to the wall of your shed or fence and you will never misplace another tool again. Baskets and buckets are also excellent for keeping your garden in order. 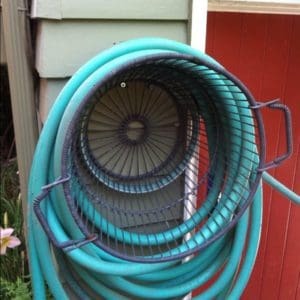 Nail the base of a large cylindrical washing basket to the wall to make an improvised hose reel with added storage. Hang handled buckets from hooks on your fence to store your equipment. The pockets in hanging shoe holders are great for keeping gloves and small tools safe. Got an old dresser or vanity chest that’s on its way to the dump? 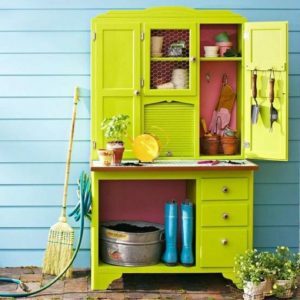 Paint it up and put it in the corner of your garden for a lovely quirky storage station. 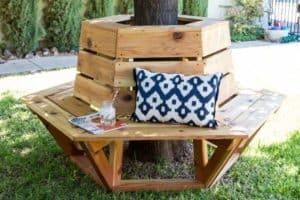 Storage benches are a fantastic DIY storage idea for any garden and they have the added benefit of doubling up as seating. 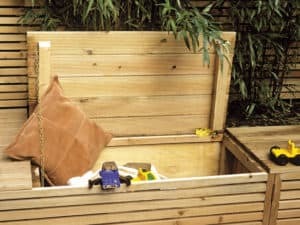 Create your own little nook by building some benches to line the sunniest corner of your garden. You can even add in a low storage table! Or if you have a tree in your garden, why not build a storage seating bench around it? Storage benches are perfect for stowing larger items such as outdoor seat cushions, kids toys and larger tools. Need to keep your bicycles and kids ride-ons safe from the elements? A simple drop canopy attached to a wall or shed will keep the rain off. 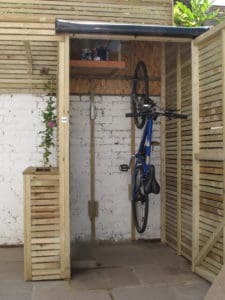 If you have more time on your hands, you could build a bike storage shed from pallets or reclaimed wood. 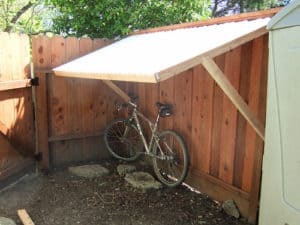 If your shed is too narrow for your bike, mount a rack on the wall and store it upright. 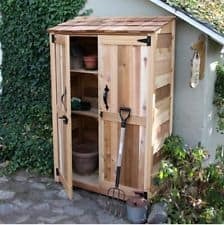 It might sound like a difficult task, but building your own garden closet or shed is easier than you think! All it takes is a little careful planning, a bit of perseverance and some faith in your DIY abilities. It will save you a fortune! If you choose to buy a shed instead, make sure you check out our handy buyer guides for the best garden sheds and cheap garden sheds. Once you get it home you can always customise it to suit your needs with some wall-to-wall shelving. Keeping all of your gear neat and tidy will save you a lot of time and sanity in the long run. 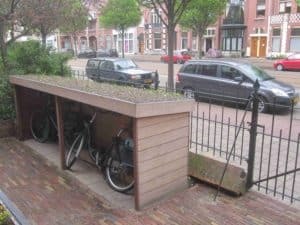 You’ll be amazed at the difference proper organisation brings to your outdoor area. Not only does it improve the functionality and appearance of your garden, it also makes it a more relaxing and tranquil space. So go on, get tidying!